This program works on helping experienced trainers and speakers to master their skills in delivery and presentation. Moreover, you will learn what the expert speakers do to create an inspiring and moving speech, how they use imagination and inspiration and increase pleasure in the classroom, in addition to dealing with difficult learners and many other things. 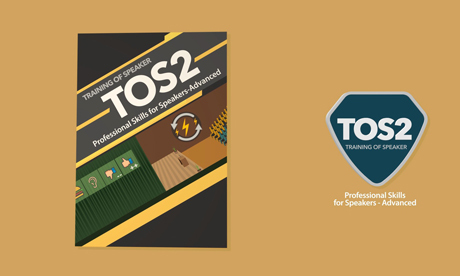 This program is directed at trainers, teachers, facilitators, lecturers, persons who have previously attended a training in train of trainers and want to develop, enhance and master their presentation skills, and persons who have attended the first level of “professional presentation skills” (TOS1). Distinguish between the three influence models and others. Use the three-level pyramid of persuasion. Design persuasive speech that influences the audience’s positions. Design to push the audience to change its behaviors. The six strategies for persuasive speech. Establish three types of speaker credibility. Design four techniques to enhance the emotional appeal in persuasive speech. Develop distinctive friendly relations with learners. Introduce a learning process full of fun. Refute the discussions in four smart steps. Design the arguments’ models: by using an example, analogy, cause, deduction, or authority. Design persuasive speechs by using Monroe's motivated sequence. Distinguish among the vocal speech components. Distinguish among the body language components. Distinguish between the moral speaker and listener’s responsibilities. Improve the listening level in an advanced manner. Provide criticism and deal with it professionally. Modify the voice effect in order to enhance the meaning of the message professionally. Use gestures and movements to enhance your message. Using the debate style smoothly. Design using the techniques of “the problem and its solution” and “the need and the plan to meet it”. Attract the audience’s attention using seven brief techniques. Prevent the emergence of problems. More than ten challenges that face new trainers and how to succeed in dealing with them. Eight main reasons for the courses’ failure. Four main factors to motivate the learners. More than twenty techniques to help motivate the learners. The most important advice to overcome boredom in the classroom. How to create an environment full of fun. Eleven features of listening and how to take advantage of them. The six steps of the listening process. Five obstacles to listening and how to overcome them easily. Nine guidelines to improve listening. How to present criticism in a professional manner. The four guidelines needed for interaction and criticism. Five basic skills for efficient listening. Changing the voice effect in order to enhance the meaning of your message professionally. Using gestures and movements to enhance your message. Using the body in a highly professional manner. Formulating the question organized for speech in a highly professional manner. How to use the technique of “the problem and its solution” in organizing speech. Using the technique of “the need–plan”. Seven techniques to attract the audience’s attention. Organizing the conclusion in three influential steps. Three types to influence others. How to use the three-level pyramid of persuasion. How to design persuasive speech that influences the audience’s positions. How do you push the audience to change its behaviors. Three types of speaker credibility and how to build them. Four strategies to show merit. Four techniques to enhance the emotional appeal in persuasive speech. The four-step strategy to refute the argument. Five models for arguments: by using an example, analogy, cause, deduction, or authority. The most common ten fallacies in arguments and how to avoid them. How to choose propositions for persuasive speechs. Three models for propositions: propositions for fact, value, and policy. Determining the verbal behavior of groups and how to deal with it. How to manage the dialogue with trainees. Three strategies for dealing and resisting learners.